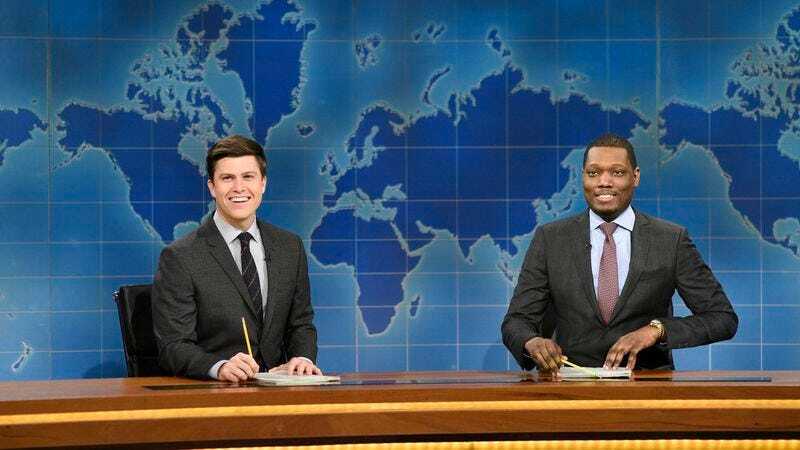 Confirming previous reports that Michael Che and Colin Jost might be headed to primetime later this year, NBC has announced a four-episode pick-up for Saturday Night Live: Weekend Update, which will begin airing Thursday, August 19 at 9 p.m. Che and Jost will host the half-hour version of the venerable news-parody segment, just as they did for last summer’s political convention specials and some of their predecessors at the Update desk did during the 2008 and 2012 general elections. “SNL is having its best season in a quarter of a century—how many shows can say that? !—so we didn’t want them to take the summer off,” NBC Entertainment Chairman Robert Greenblatt said in a press release. SNL traditionally ends its seasons in mid-May, so the hosts will presumably have some time off between the season finale and the premiere of the Update series. But when they return, they might not have Drunk Uncle, Guy Fieri, or Riblet to help them process everything that’s happened during their hiatus.